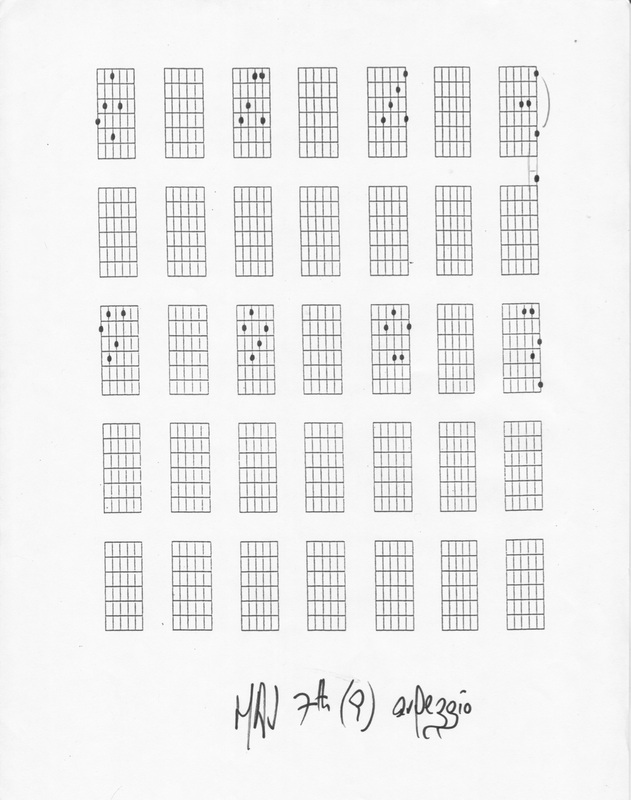 Let's build our Maj7(9) arpeggio from a C root. Those 5 notes are consecutive diatonic 3rds: it means that we only use notes from the C Major scale. The first 4 notes (C E G B) are "chord tones" and the last note (D) is considered an "extension" or "color". Let's now discuss how the C Maj7(9) arpeggio can be used over various chords. Those 4 chords all happen to be diatonic to C Major. That is not surprising when we consider that the C Major scale only has 7 notes, and that our arpeggio includes no less than 5 of them. For instance, the C Maj7(9) arpeggio against G7 (the V chord in C) would not be a good idea. The main problem would be the P4 which is not considered a desirable note on a Dominant 7th chord. And if we then considered the V chord to be a Gsus7, the problem now would be the M3: it is not considered a desirable note on a sus 7th chord. Now, if we are looking for a good sus7 sound with the Maj7(9) arpeggio, let's play it from the m7 of the desired sus7 chord. OK now get ready for a more exotic sound, still generated by our CMaj7(9) arpeggio! We can use it as an upperstructure over an Ab bass note. To summarize, the Maj7(9) arpeggio is a nice-sounding, stable group of notes. It is relatively easy to play all over the fingerboard, and it provides some very satisfying melodic material that can be played over a variety of chords.